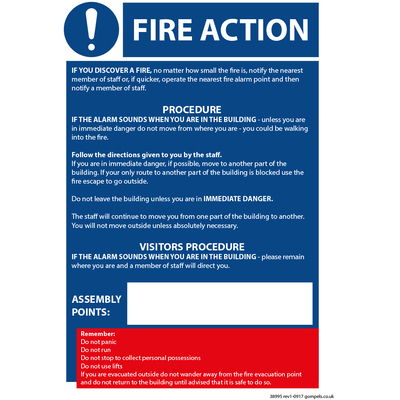 Keep your business compliant with current safety regulations by displaying our Fire Action / COSHH Golden Rules Sign. As part of our extensive signage collection, it clearly states key information and instructions that your colleagues need to know. The entire A4 sign has been constructed from 350gsm paper and is fully laminated for added protection. On one side, it offers directions on how to react in the event of a fire. On the flip side, the recent COSHH regulations are relevant for your janitorial team and can be displayed within product cupboards to ensure full compliance. Each golden rules sign is a cost-effective way of ensuring relevant information is available at all times within your business. Here at Gompels, we have a range of signs to suit your needs. Our COSH Regulation Notice A5 works within your budget while our range of Sign Holders gives a professional feel.